When I don’t have any thai curry paste at home, this is my go to recipe for a smooth, silky, and hearty stew. Note that this recipe is active cooking! Your frying and cooking time may be shorter depending on the size of your vegetables. Be aware and present while cooking this dish. The vegetables should be crispy, the photos is of the stew the day after thats why the vegetables don’t look as crispy and as vibrant in colour as they should. Slice, cut and prepare the vegetables. Juice the lime. This stew is active cooking, so everything needs to be prepared beforehand. Open you cans of coconut milk, have your spices handy. Add oil to a large pot, before heating up the oil, add ginger powder, chili, garlic and a splash of lime juice and soy sauce. Stir and ensure that the spices are soaked into the oil. Heat up the oil, stir while the pot is heating up. Reduce the heat so that the spices won’t burn. Do this for about 3-5 minutes. Add the onion. Fry for about 3 minutes. Or shorter depending on the size of your vegetables. Add the mushrooms and fry on medium temperature for 3-5 minutes. Add one can of coconut milk and the lime juice, continue to stir, let cook together on medium heat for about 3-5 minutes. Add tofu, mung beans and holy basil. Stir and add the second can of coconut milk, crumble and sprinkle the vegetable stock cubes over the stew. Let cook for about 3-5 minutes so that the tofu soak in some of the flavours. Add sugar snaps. Reduce the heat. When the sugar snaps look like they have been steamed, add the finely sliced spinach and remove the pot from the stove immediately. Taste with additional soy and lime juice. 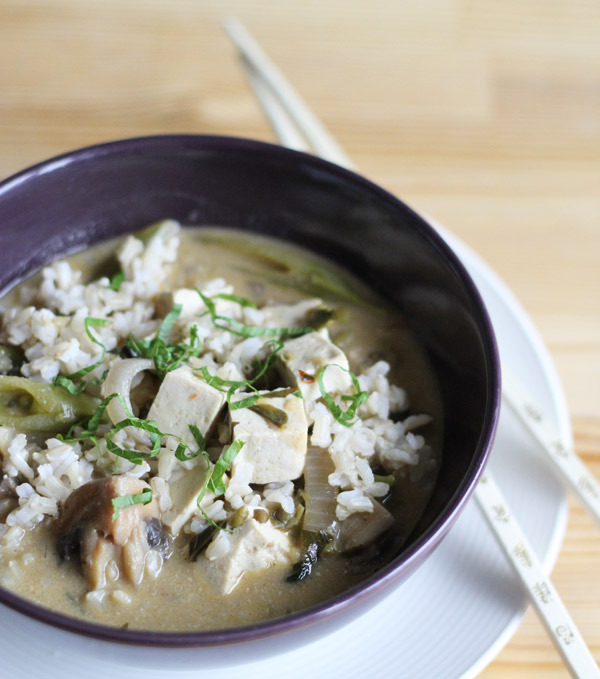 The stew should taste savoury from the lime, thai basil, ginger and coconut milk in combination. Thai basil is also referred to as Holy basil in some countries.